AFTER SEVEN YEARS of exploring the mountains of New England and the national parks of the west, in early May 1981 I passed this view on the Massachusetts Turnpike a few miles east of Boston. It was so compelling that although I was afraid of shooting with a view camera on a busy Interstate highway. In a few days it evolved into rainbows of colors from buds alone to challenge the glory of autumn, but with a pointillist texture that left the wonderful silver tree branches exposed. It became an inspiration for much of my future work. I photographed on the Pike at two locations dozens of times for over ten years. An illustration of this location is shown at Pike Image View.. Clicking on the image will take you to a gallery of images in the spring on the Mass Pike. The view was a result of a valley having been filled to keep the Pike level. It left me a vantage point about 50 feet over the ground below looking directly into the tree canopy. The maple trees were beginning to bud in surprising red and orange. As spring advanced more colors appeared. I photographed what I call the Weston overlook for over 10 years. Click on either image to go to the gallery to see other images I made from the Pike, primarily from this location and another on an entrance ramp at Exit 11. I photographed landscapes for 28 years and went through three cars and 20,000 sheets of 4"x 5" film. The images are all from unexpected places I found just by driving with an occasional treck down a well trodden path. Several of the best are from elevated sections of interstate highways. That episode ended with 911 and I begain photographing flowers in my studio and creating "interpretations" of musical instruments. I BEGAN EXPLORING FARTHER AFIELD in New England and eventually through the southeast when exhibitions of my work pulled me in that direction. However, northern New Enland became a wonderful place to visit often and my roadside experiences continued. 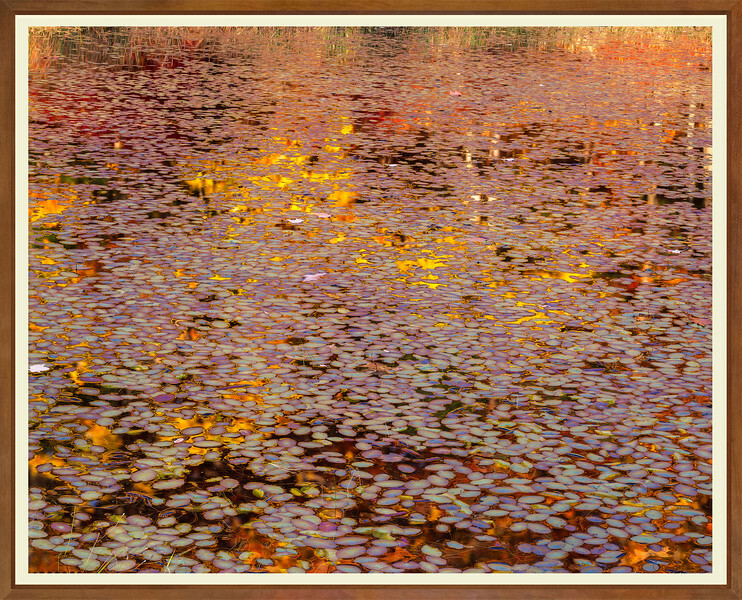 Below is the edge of a pond in Acadia National Park. MY WIFE, SUSAN, WORKED FOR A TIME for the Massachusetts Parks Department. One of her colleagues suggested I visit Walden Pond, one of the areas he managed. I went in the spring of 1991 and found some wonderful moss covered roots along the path that encircles the pond but little else. 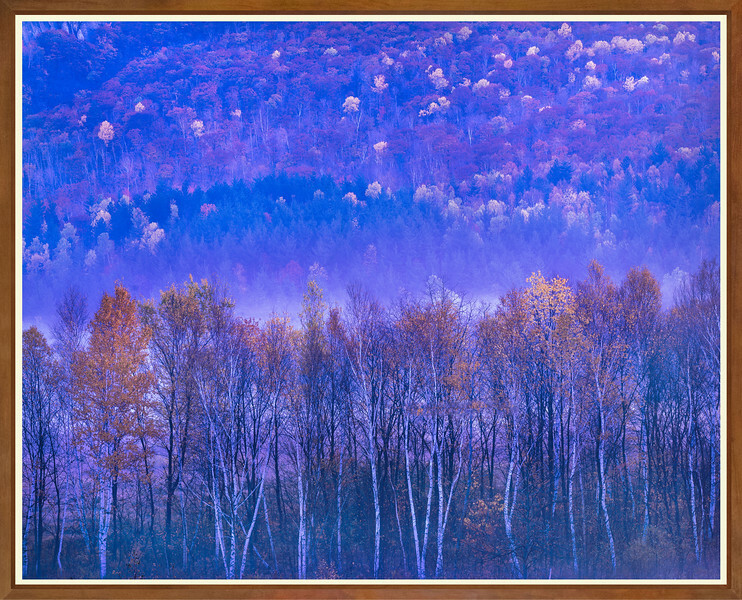 I didn't think about the park again until one fall afternoon when I was shooting on the Pike. I drove to the pond and followed the same path as before. I passed a small vernal pool just on the opposite side of the path from Throeau's Cove. 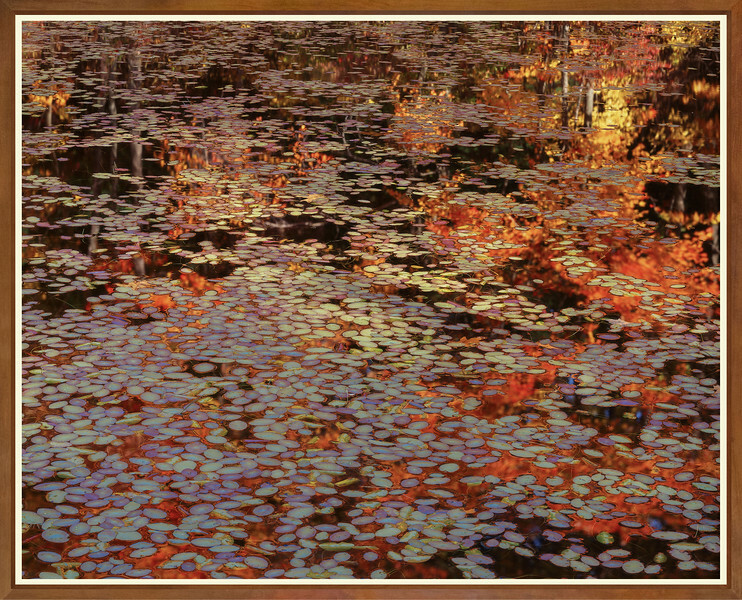 I noticed a few reflections of orange leaves from small trees surrounding the pond among water plants I later learned were water-shields. I first decided to explore aounnd Walden Pond and the site of Thoreau's cabin and then remembered the glimmers. I returned to the pool, known as Wyman's Meadow, after a local farmer from Thoreau's time. I studied the glimmeers for a few minutes and then placed my tripod at the edge of the pond and saw something very much like the image below. THE IMAGES ABOVE illustrate how I think about images. In the first two images I discovered textures. In the two images from Walden I learned how to work with texture. Neither of these images have a single central most important place where your eye wants to go. 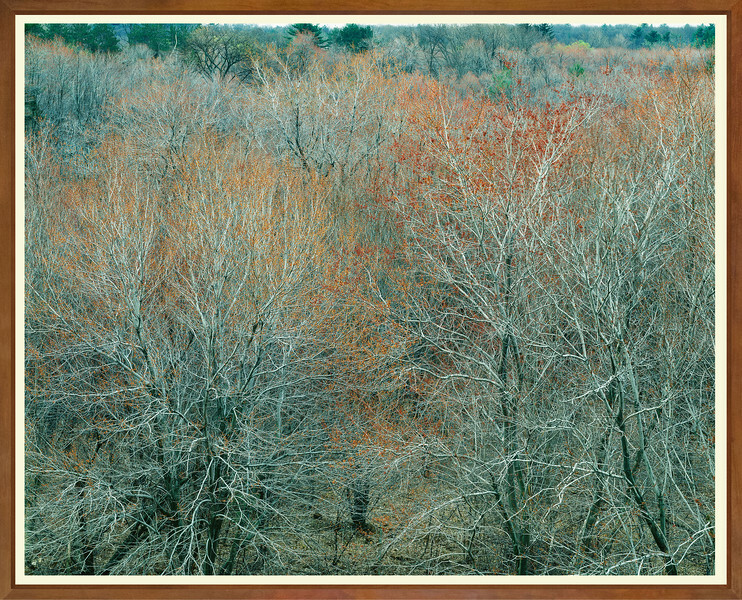 In the first, there is the yellow tree reflection in the upper right-hand corner, but it is not what makes the image. It tends to make you look over the whole image. The second Walden image is an even better illustration. Because there is no one element that dominates, your eye is free to wander. 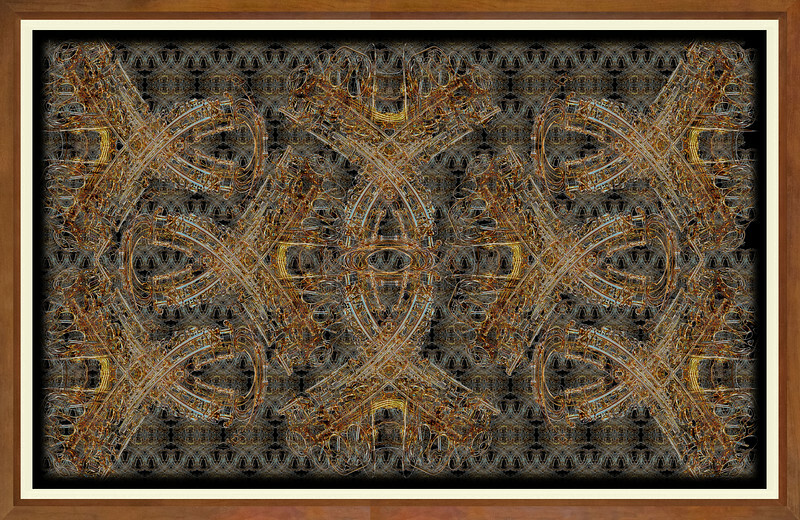 THIS IS A VARIATION on a project I began in the mid-1990s to use the forms of musical instruments to create new images. I took up the project again about fifteen years later. In these more recent versions the image is composed primrily of edges (or outlines if you wish) thus permitting layering and seeing through another. The image at the right is titled "I Can See Right Through You." At first this may seem a neat trick, but I found as I worked with it amazing possibilities. In the image below, I have taken a saxophone, bent it carefully and combined it with 15 copies. I call the image Contradance with Ostinato. An ostinato is a repeated figure in music that plays in the background. Here I use the forground image, reduced in size and multiplied to to create the background ostinato. Once these elements are in place, there are infinite variations possible, a few of which are shown in the saxophone and french horn galleries (click in the menu above). 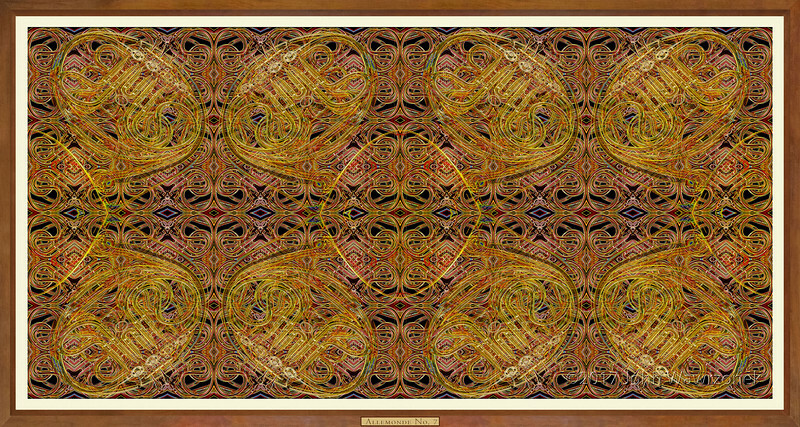 FOR VENUES THAT DEMAND WIDE IMAGES, the above "Contradance" can be doubled to 40" x 124", most likely printed as a canvas due to the difficultly of framing. Note that the foreground of this image is composed 32 individual elements, it can be evolved into images of complex color schemes and geometric variations depending on the needs of the environment. 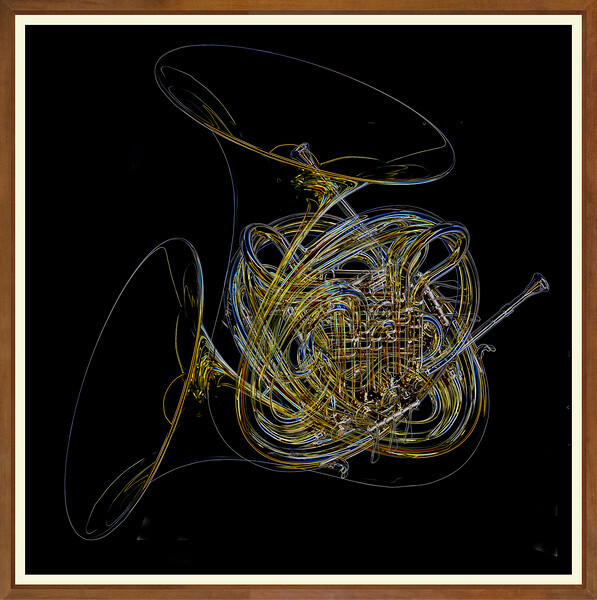 The image below is made from a single picture of a french horn. It also relies only on edges. 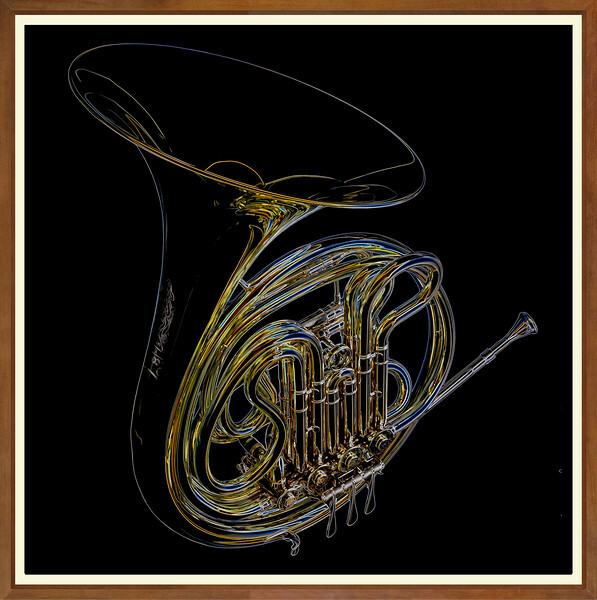 The background is a portion of the horn repeated in a manner intended to integrate with the horn shapes. As with many of my images, I intend it to be a little mysterious. Clicking on the images will take you to their respective galleries which include the original photographs from which these images were made. MELANGES are images of flower petals or blossoms from my wife's garden, photographed immediately after picking. It takes over 100 exposures to produce a finished image. The images can be divided into sections or cropped to any shape. Photography is in my studio with diffuse daylight so there are no shadows but colors are as brilliant as outdoors in full sunlight. Detail, even in a 10' print is as if the flowers were there in front of you. Other images of flowers are in the flowers gallery.